Wei’s Long Gong’s Chinese food…once and for all-puts to rest the bube-meise that Florida’s Chinese food stinks! The joint is an absolute must try! ***** Wei’s Long Gong Chinese, 11920 Southwest 8th Street, Miami, Florida 33184, (305) 553-4644. It’s the day before Christmas- Jeff Eats knows that a whole bunch of you guys- me included, are gonna be eating a ton of Chinese food over the next 2-days 🙂 – that said, here’s a real good Chinese joint for you guys in Miami! Jeff Eats is a simple (left myself open there, didn’t I?) guy-who was born in Brooklyn in 1949. I was raised on “American” Chinese food…you know- wonton soup, bbq ribs, steamed dumplings, roast pork fried rice, egg rolls, sweet & sour pork, General Tso’s chicken, pepper steak, chicken chow mein, shrimp in lobster sauce with a drop of black bean sauce mixed in, pineapple chunks, vanilla/strawberry/chocolate/pistachio ice cream, fortune cookies. Like I said, I’m a simple guy! I got friends-my age- who were born in Brooklyn, who for some reason think that- the “American” Chinese food we all grew up on-is now beneath them…when they eat Chinese, they have to have- REAL CHINESE stuff like…pepper salted quail, lambchoy minced with green bean, spicy fish with tofu, yam in sour sauce. Being a pretty easy going guy, Jeff Eats is willing to try almost any restaurant “recommended” by friends to “accommodate” friends. 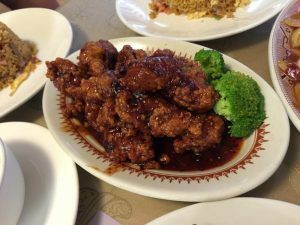 With the above in mind, Jeff Eats, Mrs. Jeff Eats and three “former” Brooklyn couples recently- did Wei’s Long Gong Chinese. Real simple- the wonton soup, egg rolls, steamed dumplings, General Tso’s chicken, roast pork fried rice, shrimp in lobster sauce with a drop of black bean sauce mixed in- were all delicious. I have absolutely no idea how the pepper salted quail, lambchoy minced with green bean, spicy fish with tofu, yam in sour sauce- tasted…but Jeff Eats’ Brooklyn friends said to tell you, these dishes were terrific. By the way, the pineapple chunks and the fortune cookies-were, pineapple chunks and fortune cookies! Trust Jeff Eats with this one, Wei’s Long Gong Chinese’s “American” Chinese food is very-very good…if this joint was in my neighborhood, I’d be a real steady customer. Just a gut call, but I’m thinking that you guys who like REAL CHINESE FOOD will also- really enjoy Wei’s Long Gong Chinese. You can check menu/prices at weislonggong.com. Wei’s is open Sunday, Monday, Wednesday, Thursday 11:30am-9:30pm, Friday 11:30am-10pm, Saturday 11:30am-11pm, closed on Tuesday. Wei’s Long Gong Chinese, 11920 Southwest 8th Street, Miami, Florida 33184, (305) 553-4644.